The combination of heat, moisture, and rubbing that occurs on your feet while playing sports, hiking, and other activities can irritate the skin causing blisters to form in response. If you have already developed a blister, gently drain the fluid by inserting a sterilized needle into the edge. Treat with antibiotic ointment and cover with a bandage and limit activity on the affected area so healing can occur. Determine where there are hot spots – Before a blister forms, the skin will become red and irritated. By covering the spot with tape, liquid bandage, or moleskin, you can decrease the friction and avoid any blistering. Also, check inside your shoes to see if there is a corresponding part of the shoe that is causing the irritation. Change to different shoes if necessary. Stay properly hydrated – Your feet can become swollen when you are not properly hydrated. Drink plenty of healthy fluids before, during, and after exercise to maintain your proper fluid balance and help avoid blistering. Shoe choice – Tightly fitting shoes like high heels or shoes that are too loose can both lead to friction and pressure that can create blisters. Always have your shoes properly fitted and make sure there is enough room in the toe box to prevent rubbing. For blisters that aren’t healing or that become infected you need to consult with a foot care specialist for the proper treatment. At Family Foot & Ankle Clinic, Dr. Stephen Markantone treats a wide variety of foot and ankle conditions including sports injuries, diabetic foot issues, pediatric foot conditions, toe and foot deformities, fungal infections, and heel problems. Equipped with the most advanced technologies and a dedicated staff, Family Foot & Ankle Clinic provides individualized and high-quality care for patients in the North Versailles and Delmont, PA areas. Contact our North Versailles office at 412-824-9370 or our Delmont office at 724-733-3338 to schedule an appointment. There are many types of arthritis that cause and exacerbate painful problems with joints, muscles, and bones throughout your body. These problems are often more noticeable in the feet and ankles where pain, swelling and stiffness cause considerable difficulty with mobility. Osteoarthritis – this common form of arthritis is caused by the deterioration of cartilage that separates the bones and prevents them from rubbing. While the big toe joints are most often affected by this condition the ankle joint is also highly susceptible. Gouty arthritis – uric acid build up in the blood can cause painful crystals to form in the joints. Foods that are high in purines and alcoholic beverages contribute to this increase in uric acid formation, so watching your diet can help avoid getting gout. Reactionary arthritis – this is a type of arthritis that is precipitated by an infection of the gastrointestinal system or urinary tract. The infection causes inflammation in the bladder and kidneys that can lead to swelling and stiffness in the joints of the knees, ankles, and toes. 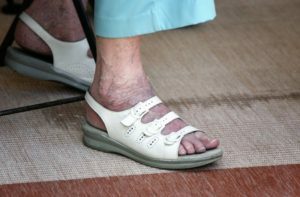 Arthritic pain in the feet and ankles can be treated with a variety of methods by your foot care professional to help ease the pain and discomfort. At Family Foot & Ankle Clinic, Dr. Stephen Markantone treats a wide variety of foot and ankle conditions including sports injuries, diabetic foot issues, pediatric foot conditions, toe and foot deformities, fungal infections, and heel problems. Equipped with the most advanced technologies and a dedicated staff, Family Foot & Ankle Clinic provides individualized and high-quality care for patients in the North Versailles and Delmont, PA areas. Contact our North Versailles office at 412-824-9370 or our Delmont office at 724-733-3338 to schedule an appointment.